Originally from Glen Burnie, Julia is a Computer Science major. 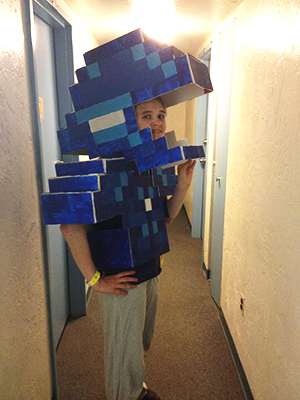 For Halloween she made her own set of cobalt armor inspired by the video game Terraria. When did you become interested in Computer Science? After my freshman year at UMBC. I was a CMPE major for my first year, but I decided that I enjoyed CMSC more. What area of Computer Science interests you the most? I just really love writing code. What are your plans after graduation? I plan to get a job in the industry, possibly a defense contractor position. What is your dream job? Any job that lets me be creative with my coding and gives me interesting problems to solve. Who is your favorite professor or course? Dr. Park is an amazing professor. He's really great about making his subject matter interesting, no matter what class he's teaching. Are you part of any on-campus clubs, organizations, teams, or labs? I'm an active member of Humans versus Zombies club. What is the best part about being a CWIT Scholar/ Affiliate? The support network. I don't know how I would've gotten as far as I have without their help. What advice would you give to other females entering the field? Adversity toward women in computer science has really died down, and there are a lot of support groups out there for women in technology now. That doesn't mean you'll never encounter adversity, but it does mean that you can do something about it, and there are lots of people–like those at CWIT–who will be glad to help you. What advice would you give to incoming students? Get plenty of sleep! What is the best part about campus life at UMBC? Everything is within a few minutes walking distance. That means you don't have to get up really early to get to class, you can go get food between classes without being late, and you can grab a bunch of people and go to late night at the dining hall. What is your favorite spot on campus? The commuter lounge in the Commons is almost always full of cool people. It's a great place to hang out between classes. Where can you get the best coffee/lunch/ food or beverage of choice? The sandwich shop in the Administration building probably has the best lunch-type food. The Skylight lounge is another often-overlooked place with really good food, too.